The beauty market is saturated with lotions, creams, and serums that claim to help achieve the youthful complexion that we all crave. But what if the best solution for flawless skin (and much more) didn’t come from topical products, but from within? In this article, we will do a deep dive into the top 10 best collagen supplements for your dollar in 2019. Collagen is a long-chain amino acid composed of glycerin, proline, hydroxyproline, and arginine. It is the most abundant protein in the body and makes up 70% of the total protein in your skin. It is essential not only for building muscle, but for healthy skin elasticity, good joint health, and strong hair and nails. Unfortunately, the average person’s diet in 2019 contains very little collagen protein compared to that of our ancestors. It is for this reason that more and more people are turning to collagen supplements to help boost their intake of this critical nutrient while enjoying stronger, tighter muscles and healthier, more radiant skin. Collagen is not only responsible for giving elasticity to skin and strengthening your hair and nails, but also boosting your metabolism and building healthy DNA strands. Maintaining healthy levels of collagen in the body becomes more critical as we age, because as we get older, our body tends to produce less and less, leading to sagging skin, wrinkles, and weaker cartilage in your joints. From the age of 25 onwards, our collagen production decreases at a rate of 1% per year. Unhealthy, high-sugar diets, smoking and sun exposure also can accelerate this decrease in collagen production. Many years ago, people consumed more collagen in their diets through the eating whole animals, particularly collagen-rich animal parts such as skin, tendons, and ligaments. Today, however, most people reject these parts of the animal and many do not eat animal products at all. Fortunately, adding a collagen supplement to your diet is an easy and effective way to boost and maintain healthy collagen levels at any age. Anti-Aging: Depletion in collagen levels is the primary cause of the various signs of aging such as wrinkles and fine lines and loose, sagging skin. The bottom layer of your skin, known as the dermis, is responsible for maintaining skin elasticity. Collagen is a major component in your skin and is found primarily in the dermis. By increasing collagen levels, your dermis can keep your skin firm and supple and numerous studies have shown that regular consumption of collagen supplements even saw a decrease in the wrinkles that have already appeared. Skin: Besides elasticity, collagen is also responsible for keeping a moisturized, even skin tone. Decreased levels of the amino acids found in collagen can lead to small veins and arteries appearing under the skin and dryer, dull looking skin. Maintaining the levels of these amino acids moisturize and diminish the appearance of imperfections, leading to softer, smoother, more supple and youthful looking skin. Hair: Collagen also plays a significant role in hair strength, preventing hair loss and maintaining natural color. Taking collagen supplements can fight the production of free radicals, which damage the hair follicles leading to hair loss. Sufficient collagen levels strengthen the hair follicles, to improve hair growth and volume. Teeth and Nails: Collagen is the building block of your teeth and nails. Splitting and peeling nails is a sign that your collagen levels need a boost. Collagen supplements allow for healthy, strong nails and an increase in nail growth. Similarly, collagen forms the structure of the teeth and connective tissue around it. Boosting your collagen levels will allow you to build a beautiful smile from the inside. Scarring: Collagen is essential for healthy tissue formation. Scars caused by acne or other problems can ruin your chances at a flawless complexion. Taking collagen supplements helps the skin naturally repair itself by promoting healthy tissue formation, which speeds up the healing process. Joints: Decreased levels of collagen can also have an adverse effect on our joints. As we age and produce less collagen, our tendons and ligaments get stiffer; our joints become swollen and we move with less ease. Taking collagen supplements can prevent joint deterioration, reduce joint pain and allow our joints to move easier. In fact, collagen supplements have also been shown to be effective in treating osteoporosis and other joint problems. The only ingredient in this protein powder is hydrolyzed fish collagen from wild-caught deep sea fish. That means there are no additives, preservatives, or anything artificial. If you like to know exactly what’s going in your body, this powder lets you do just that. Amandean always uses wild-caught fish, never farmed fish, so there are no hormones or antibiotics, and it’s a much more sustainable practice. Improves Skin Health: This protein powder can also help improve skin health, including reducing the appearance of wrinkles and boosting your skin’s elasticity, making you look younger, healthier, and more radiant. Replacing collagen can also help fade the appearance of scars and can even help clear up some skin conditions. Costs $0.80 per serving. Not the most expensive in the list but certainly not the cheapest. It also does have a faint hint of taste to it. It’s not noticeably fishy, but it’s enough that if you mix it with plain water or coffee you may not like it. This protein powder is easy to love, especially for someone who cares about where their supplements come from. With collagen from only wild caught fish, you know what you’re getting is fresh, sustainable, and clean. It also offers an alternative for those who don’t like or don’t agree with, bovine collagen supplements. Some people may be hesitant to try fish collagen supplements out of fear that it’ll taste fishy, but the best part is this protein powder is totally flavorless, odorless, and mixes seamlessly into almost anything, including yogurt and entire meals. 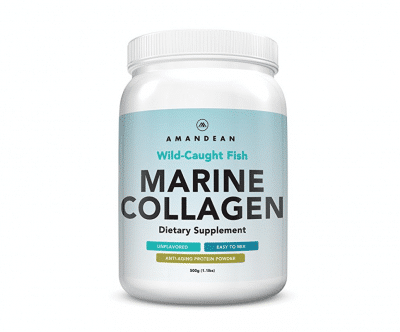 All of this makes Amandean Marine Collagen Peptides a supplement worth trying. Hydrolyzed Collagen: Each serving contains 7.5g of Hydrolyzed collagen protein, which is enough to yield strong results including plumper skin and stronger hair and nails. Hydrolyzed Gelatin: Unlike most collagen powders, Bulletproof CollaGelatin contains hydrolyzed gelatin, like that found in bone broth, which has added benefits in addition to the collagen protein. Those with joint pain will benefit most, as this gelatin has been found to help repair cartilage and maintain strong joints. Grass-Fed Cows: Bulletproof only sources from grass-fed, pasture-raised cows that are free from drugs, chemicals, hormones or antibiotics. It is FDA certified and designated GRA (Generally Regarded as Safe). The biggest downside is that it does not mix well in cold liquids. The added gelatin turns into a gel (duh) when mixed with cold water or milk, so this supplement is best added to hot coffee or tea. I’ve found it can be tolerable when added to a protein shake as long as you use a blender or a blender ball, but you will still notice it can be a little clumpy. This collagen supplement is highly effective for promoting healthy skin and muscle, plus the added gelatin is great for your joints. The added joint support becomes more and more critical as we age. The large dosage of collagen and gelatin per serving ensure maximum results, and the powder dissolves very well in coffee with a pleasant flavor. This is a brand you can trust and I would definitely recommend this to anyone who wants an added joint-care boost in their collagen supplement. The collagen used in this supplement was sourced from grass-fed, pasture raised cows, not cows packed with hormones and GMOs. In that bovine collagen, there are three distinct forms of collagen, 1, 2, and 3, which all work together to protect the various systems in your body. This supplement, among other things, can promote joint mobility and ease joint discomfort, support a healthy gut biome, improve hair, nail, and skin health, along with promoting quicker muscle recovery times. Easy to Mix: This powder is super easy to measure out and mix into drinks. All you have to do is measure out one even scoop and dump it into your drink of choice. Since this powder is unflavored, it works well with just about any drink. Whether you want to add it to your coffee, juice, smoothie, or work it into a recipe, it easily mixes in, both in solubility and flavor. The only thing I wouldn’t mix this powder in is plain, cold water. While a cold glass of water can be refreshing, this powder is more likely to clump in cold water and since water offers no additional flavor, it may make the water taste a little “off”. No Additives: Regardless of what diet you’re on, you’ll likely be able to use ForestLeaf Advanced Hydrolyzed Collagen Peptides. It contains nothing but pure hydrolyzed grass-fed pasture-raised bovine collagen peptides and hydrolyzed chicken cartilage collagen, no sugar, dairy, gluten, nuts, soy, fish, preservatives, or additives. Can get clumpy when mixed in cold water. It also seems to run out after less than 41 servings. I may have been a little liberal with the scooper, but this seemed to run out after a month or less of daily use. In the end, the downsides to this product are negligible. Clumping can be avoided by using a blender or by not using cold water. 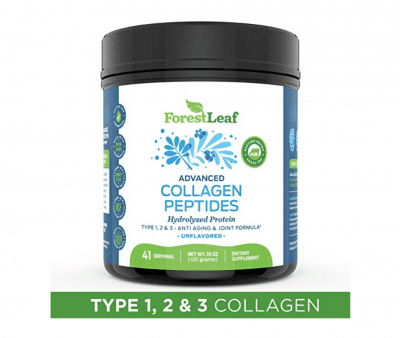 This still makes it perfect for mixing into coffee or hot cocoa, and with all of the health benefits that come with it and great price point, it’s hard to not recommend these hydrolyzed collagen peptides from ForestLeaf. Hydrolyzed Collagen: Neocell Super Powder Collagen contains 6,600mg of Hydrolyzed Collagen Powder. Taken daily, you will notice visible improvements in your skin’s youth and elasticity including minimizing fine lines and wrinkles, as well as the strengthening of your hair, nails, and bones. Type I & III + Enzymes: Super Collagen contains Type 1 and Type 3 collagen, which makes up 90% of the collagen found in your body. The supplement is also high in hydroxyproline and hydroxylysine, two amino acids that are specific to collagen and are important for maximizing the body’s collagen production. To top things off, it also includes an advanced enzymatic hydrolyzation process that makes it more bioavailable in the body. Powder: Neocell Super Powder Collagen comes in powder form, which is incredibly easy to add to your diet. You don’t need to make any dietary changes to take in this supplement. Simply mix the powder into your morning coffee or glass of juice to see great results. It is tasteless and odorless (mostly) so you won’t notice much difference in taste when added to your drinks or protein shakes. 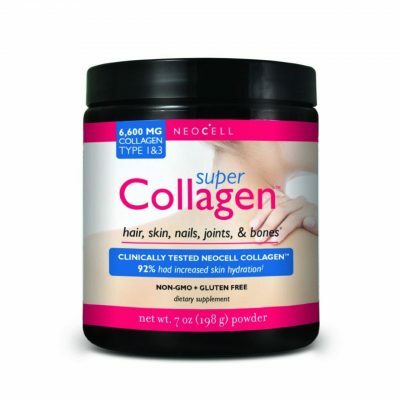 Low Price: Neocell Super Powder Collagen contains a standard month’s supply of 30 servings. This standard amount doesn’t seem impressive until you factor into account the low price. Priced much lower than many other collagen supplements, Neocell Super Powder Collagen gives you a great way to enjoy the many benefits of collagen supplements at a lower cost than average. In fact, Neocell Super Powder Collagen comes in as the least expensive collagen supplement on our list. Neocell Super Powder Collagen has one minor drawback – the fact the powder contains only pure hydrolyzed collagen, without any additional collagen-boosting nutrients such as Vitamin C. Vitamin C is essential for the formation and utilization of collagen in the body so it’s highly beneficial to add to collagen supplements. However, because it comes in convenient powder form, it is very easy to add to any liquid. Therefore, it is simple and highly recommended, to add Neocell Super Powder Collagen to a glass of juice containing Vitamin C for maximum benefits. If that’s not enough, Neocell also offers alternatives to the powder with tablet and liquid varieties, which are both formulated with Vitamin C.
Neocell Super Powder Collagen is a great option from a trusted brand in collagen supplements. The low price makes it a great option for people wanting to try collagen supplements for the first time without committing to a product with a steeper price tag and the use of super collagen makes this highly effective and bioavailable. Easily add the great supplement into your diet to see visible results in a matter of weeks. Collagen Peptides: One scoop of Sports Research Premium Collagen Peptides contains 11g of Collagen Peptides. One serving, taken daily is packed with easily digestible, gut friendly amino acids that help counteract the degenerative effects of aging. Youthful skin, strong bones, healthy joints and improved gut health are some of the many benefits from adding this supplement to your diet. Powder: This unflavored, neutral tasting powder is incredibly easy to add to your diet. Soluble in both hot and cold water, this powder is easily mixed into your daily coffee or afternoon juice and doesn’t affect the taste of your beverage. You can also add it to a variety of foods such as yogurt and oatmeal. Such a simple addition to your diet will lead to incredible health benefits. Grass-Fed: Sports Research Premium Collagen Peptides is sourced from grass-fed, pasture-raised cows, so there is no harmful addition of hormones, drugs, antibiotics or chemicals. It is also paleo friendly, gluten free and non-GMO, so it’s suitable for all diets. Money Back Guarantee: In case you’re still weary about trying collagen supplements, Sports Research Premium Collagen Peptides offer a complete 90-day money back guarantee. If you see no results within 90 days and are unhappy with your purchase, you can contact the company for your money back. However, this is unlikely as by 90 days you are sure to see the noticeable, visible results from taking your collagen supplements. As with the other collagen powder supplements on this list, the major drawback to Sports Research Premium Collagen Peptides is that it is not fortified with Vitamin C, due to it being 100% collagen powder. Collagen works best when combined with Vitamin C, so it is highly beneficial to take them together. However, as it comes in powder form, this gives you a huge variety of ways to add this collagen supplement to your diet. The most beneficial and recommended way is, of course, to take it with a source of Vitamin C, such as a juice or smoothie containing citric fruits. This way you will get the most from your collagen supplement and you will have the added benefit of increasing your Vitamin C content. Sports Research Premium Collagen Peptides are a hugely beneficial collagen supplement, particularly for gut health. The gut-friendly formula is easily absorbed into the body and the powder form makes it incredibly easy to add it to your favorite drink or a variety of foods so you can add collagen supplements easily without making changes to your diet. The container also contains 40 servings, which is more than the standard month’s supply so you will benefit from the extra amount. Overall, this might be my personal favorite. Only contains collagen type 1 & 3 (although these are the most important). It also does not mix all that great in cold or even room temperature liquids. It comes in a very fine powder which makes you think it will easily dissolve in whatever you throw at it, unfortunately, it falls a bit short in that department. Use hot liquids. Although this protein powder only contains collagen types 1 and 3, it still packs a punch of 18 essential amino acids. It gives you exactly what you want without trying to add a bunch of fancy ingredients to drive up the price (this is one of the cheapest per serving on the market). The only real downside is that it tends to clump up in some types of liquids, and it does have a slight beefy taste to it. 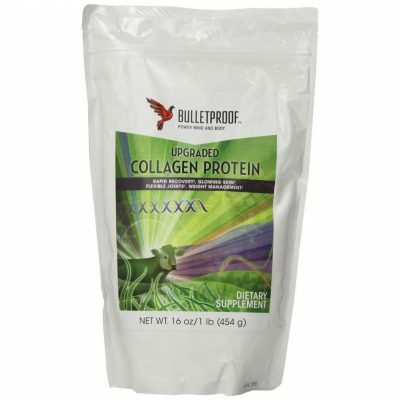 This collagen is sourced from bovine, chicken, fish, and eggshells, and combined into a perfect blend. Best of all, even though there is collagen from fish and eggshells, this powder is still totally odorless and tasteless. Mixes Into Everything: From coffee to soup, this protein powder mixes into just about anything in a matter of seconds. It can even be worked into your favorite meals or baking recipes. Since it’s unflavored, it takes the backseat in any dish or drink and you’re able to get all the benefits of it without ever tasting it. Promotes Digestive Health: If you’ve tried other protein powders or supplements, you know that digestibility can be a big issue. Large amounts of protein tend to cause intestinal discomfort. But all of that’s a thing of the past with this protein powder, which is not only easy to digest but actually promotes a healthy gut as well. Although this is unflavored, it does have a hint of “meaty” taste (and smell) to it. It isn’t noticeable if you mix it into anything with flavor, but you will taste it in plain water or coffee. Also, the wide variety of sources means more people are likely to have an adverse reaction to it. Some reviewers report stomach distress or even rashes. Although this protein powder does not have as much protein per serving as some others, it makes up for it by sourcing its collagen from a huge variety of sources (more than any other). This can be good or bad, depending on how sensitive you are to certain types of animal products. It should also be noted that this is one of the most expensive options out there, so if you are looking for something entry-level, this may not be for you. 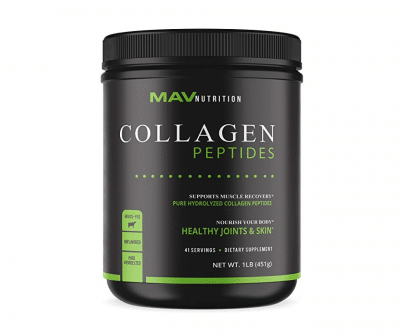 Every single serving of MAV Nutrition’s Collagen Peptides contains 18 out of 20 amino acids. Amino acids are the building blocks of proteins and are very important to your body. This boost of amino acids can reduce exercise fatigue and speed up muscle recovery time, making it great for athletes. 11g of Collagen in Every Serving: With 11 grams of collagen in every serving, you’ll be able to feel the difference between this and your normal cup of joe in the morning. Collagen is essential to healthy hair, nails, and skin and has even shown to have some anti-aging effects on skin, including fighting wrinkles and cellulite. Promotes Weight Loss: Collagen peptides also act as a natural appetite suppressant and help keep you full between meals. This can help cut down on snacking between meals and fight cravings, two of diets’ biggest saboteurs. This mix can help get your diet and fitness back on track, but you’ll see the best results when used with a healthy diet and exercise regime. To be blunt, it doesn’t taste very good. It claims to be unflavored but does have a pretty noticeable beef-like taste and smell (if you’ve taken collagen supplements before you know what I’m talking about). I personally don’t mind it, and it can be masked fairly easily, but if you’re looking for something truly unflavored, this is not it. There is a lot to love about this supplement, but what stands out the most is the sheer amount of amino acids packed into every serving. It is also the most cost-effective collagen supplement in this list at only $.63 per serving. At the end of the day, it will come down to whether you like the taste or not. It does have arguably the strongest “beefy” flavor of any in the list, but it is still quite tolerable, especially if you’re a veteran to collagen supplements. 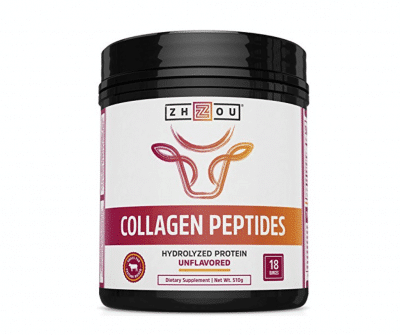 Collagen Peptides: Unlike Hydrolyzed Collagen, which comes from the bones and cartilage of animals, Collagen Peptides comes from the bovine skin. One serving of Vital Proteins Pasture-Raised, Grass-Fed Collagen Peptides contains 20g of collagen peptide, more than any other major competitor. Many people will notice more plumper, more youthful skin and faster hair and nail growth in only a few weeks of daily use. 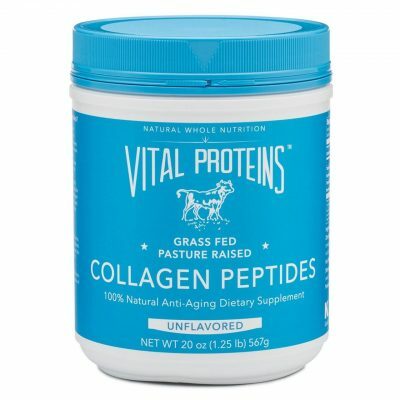 Grass-Fed: Vital Proteins Collagen Peptides are sourced from grass-fed, pasture-raised bovine hides that have no contact with drugs, hormones or other harmful chemicals. This supplement is also Kosher and non-GMO (Genetically Modified). Soluble in Hot or Cold Liquids: Because it is soluble in both hot and cold liquids, Vital Proteins Collagen Peptides are incredibly easy to add to your diet. You simply dissolve it in a liquid or beverage of your choice, including smoothies and soups, so your choices are not limited to the same drink every day. Especially because it is soluble in water, this makes it very easy to take collagen supplements for people who don’t drink hot liquids like tea or coffee or who prefer mixing their collagen with other ingredients such as Vitamin C to boost collagen function. Servings per container. One container is 20oz of peptides which comes to 23 servings at 2 scoops per serving. This is less than the standard one month supply of many other collagen supplements. It should be noted, however, that it packs a larger dose of collagen peptides per serving than others. Vital Proteins is the most reputable collagen brand on the market for a reason. This particular supplement is highly bioavailable, easily digestible, and is soluble in just about any liquid hot or cold. This is a big advantage for people who don’t like hot drinks like tea or coffee. It has no discernable flavor, is free from harmful hormones, and has no added chemicals or sweeteners. Plus, it’s sourced from grass-fed, pasture-raised bovine hides. You won’t be disappointed with this collagen powder. Hydrolyzed Collagen: Each tablet of Youtheory Collagen Advanced Formula Tablets contains 1000mg of Hydrolyzed Collagen. With six tablets taken daily, your daily collagen amount will be 6000mg and within a matter of weeks, you will start to see noticeable improvements in your hair, skin and nails. Those suffering from joint pain will also notice a decrease in pain after continued use. Vitamin C: Essential for the formation and utilization of collagen, vitamin C is an important addition to every collagen supplement regime. Vitamin C is not produced by the body but is required for the formation of collagen. Youtheory Collagen Advanced Formula Tablets are fortified with Vitamin C, containing 60mg of Vitamin C per serving (six tablets). So you will make the most of your collagen supplements by ensuring not only that your supplements are properly absorbed into the body but that natural collagen is properly formed for youthful skin, stronger hair and nails and a healthier gut. Type 1 & 3 Collagen: Type 1 and Type 3 collagen make up the majority of collagen produced by your body and is generally found in your skin, muscles and connective tissue. 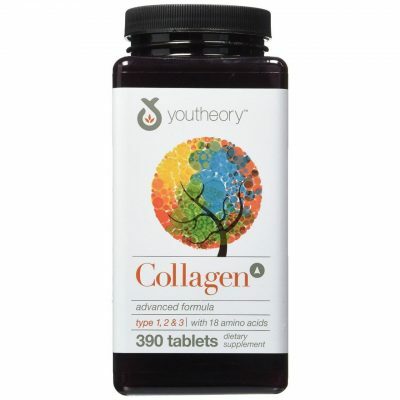 Youtheory Collagen Advanced Formula Tablets contain type 1 and 3 collagen, as well as Vitamin C for the critical formation of collagen in the body and the ongoing health of your hair, skin, cartilage, ligaments and other body tissues. Type 2 Collagen: Type 2 collagen makes up a significant amount of your body’s cartilage and naturally produced hyaluronic acid to cushion and lubricate your joints. Type 2 collagen and hyaluronic acid are vital components of the skin, leading to a healthier, glowing complexion. Type 2 collagen also contains chondroitin sulfate, a naturally occurring chemical that provides anti-inflammatory support. The major disadvantage to Youtheory Collagen Advanced Formula Tablets, as well as other collagen tablets is the serving method. Unlike powder, which is easily added to your food or drink and therefore is easy to add to your diet, collagen tablets must be ingested daily. One serving is comprised of three tablets taken twice daily on an empty stomach. This may be a little difficult to adjust to at first. However, once you develop the habit, it is easy to remember to take the tablets in the morning and evening and the huge benefits you receive will make the small adjustment to your schedule more than worthwhile. I would definitely recommend Youtheory Collagen Advanced Formula Tablets to anyone who is looking for collagen supplements in tablet form. Fortified with Vitamin C, it is easy to ensure you are maximizing the benefits of your collagen with minimal effort with no mixing or mess. This is definitely a pick for those looking for healthy skin and anti-aging benefits. For those looking for a high dose of protein, this may not be for you. Collagen in supplements will usually come in one of two forms: Hydrolyzed Collagen, which is derived from bovine bone and cartilage is more easily absorbed by the body or Collagen Peptides, which is derived from bovine skin and hide. There are three types of collagen. Studies have shown that 90% of the collagen found in the body is Type 1 and Type 3 collagen, which have protein compositions of nineteen amino acids, found in the skin and muscle. Type 2 collagen contains eighteen amino acids and is mainly found in the joint cartilage. Look for collagen supplements that contain other collagen-boosting nutrients such as Vitamin C or Hyaluronic Acid. Make sure your collagen is sourced from Grass-fed, pasture-raised cows to avoid extra hormones or chemicals. Collagen powder is often easiest to take since it can be added to smoothies or other beverages (orange juice works great because of the Vitamin C content) but not all collagen supplements mix easily in cold liquids. Collagen supplements should have a dosage of at least 6,000mg to see best results. Hydrolyzed collagen is a type of collagen that is also known as collagen hydrolysate, collagen peptide, gelatine, gelatine hydrolysate, and hydrolyzed gelatin. It is synthesized from animal by-products from the meat industry, including bones, skin and connective tissue. The process involves cleaving the molecular bonds between collagen peptides using combinations of biological, chemical and physical means. Hydrolyzed collagen is easy to consume because of its neutral taste and odor. Consuming it enables your body to maximize the health benefits of collagen. These include promotion of healthy hair, skin and nails; support for bone and joint health; weight management, and aid with digestion. 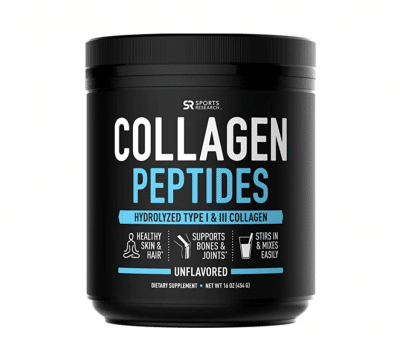 What are Collagen Peptides Then? Collagen peptides are short chains of amino acids that are usually sold as powder. They contain high concentrations of the amino acids that are used to build collagen. These bioactive compounds are produced by enzymatic hydrolysis of collagen. This means breaking down the molecular bonds between individual collagen fibrils to peptides. The process reduces collagen protein strands into smaller peptides with molecular weights of less than 5000Da. Collagen peptides are more bioavailable. They are more readily absorbed into the bloodstream because they consist of much shorter chains of amino acids than collagen. Since they are shorter, collagen peptides are more easily broken down into a form that can be absorbed into the bloodstream. After absorption, they travel to different parts of the body to repair, rebuild and provide energy. No matter which type of collagen you select (as long as it is a quality brand, unflavored, and 100% pure) you should see similar results over time. There are several ways to increase collagen in your daily diet. One of the easiest ways to increase collagen consumption is by making a bone broth. It’s a healthy, delicious and a cost-effective way to use part of an animal that can’t be eaten directly. As these inedible animal parts simmer for hours or days, they release collagen in an easy to absorb broth. Whether you’re getting your collagen through supplements or through food, it is important to note that are many factors that support the formation and use of collagen in the body, such as vitamin C, manganese, copper, proline and foods high in anthocyanins (such as blueberries, cherries and blackberries). In order for collagen to be “activated” so to speak, in the body, always take your collagen with a source of amino acids and vitamin C, or make sure that your supplements include these active nutrients to ensure absorption and usefulness to your body. Additionally, while many creams claim to “revitalize your skin” using collagen, the molecules in these topical products are usually too large for your skin to absorb. For those companies that sell micronized collagen, which are meant to be small enough to be absorbed through the skin, it is unlikely these micro molecules would be in any form usable by skin cells. It is also highly likely that any collagen that actually manages to penetrate the skin would be challenged by the body’s immune system as a “foreign body.” It is far more effective to transform your body from the inside out using supplementation and foods like bone broth. Lastly, animal products like eggs, poultry, fish, and milk can all help boost collagen formation. If you are a vegetarian or don’t consume a lot of animal products, you should consider using a collagen peptide supplement as you are likely lacking this in your diet. In addition to the laundry list of benefits discussed earlier, collagen supplements can also improve and strengthen the blood vessels and circulation within the body, including blood vessel elasticity. As a result, blood and nutrients are delivered to your skin, resulting in more healthy, radiant and youthful-looking skin. Another added benefit of collagen supplements is faster recovery from injuries to the body. It turns out that collagen is needed to repair and rebuild connective tissue, which is also essential for strong muscles, skin, and joints. It also strengthens the structure of bones, tendons, cartilage and ligaments. Some even report that increased collagen intake can relieve arthritis pain. Sick of stubborn cellulite? Research is showing that collagen supplements can reduce the appearance of unwanted cellulite. Cellulite begins to appear when fatty tissue pushes upward through fibers into the upper layer of skin. The result is a highly unappealing, dimpled appearance of the skin. Collagen works from the inside of your body to reduce the appearance of cellulite by strengthening and thickening the skin. But that’s not all… sources confirm that collagen does, in fact, reduce wrinkles as well. Wrinkles are primarily caused by collagen depletion that occurs during the aging process. This causes the skin on the face to become loose and saggy which makes wrinkles more pronounced. Regularly taking collagen supplements helps to firm up the skin and keep it plumper, softer, and more even. As an added bonus, it also improves hair and nail quality, growth and overall appearance. As we age, our body naturally produces less and less collagen leading to a number of age-related degenerative results, such as wrinkles, sagging skin, thinning hair, brittle nails, painful joints and osteoporosis. Taking collagen daily is highly beneficial not only for building and maintaining muscle but also for preventing many of these natural effects of aging. 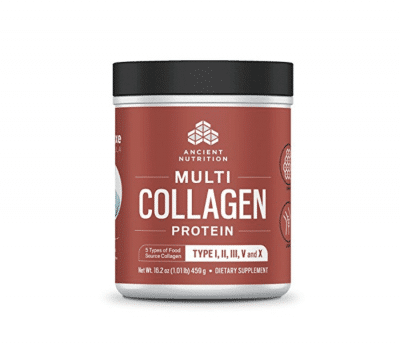 All of the collagen supplements reviewed in this article are of high quality and will give you the results you’re looking for when taken consistently. If I had to select only one as the all-around best, I’d go with ForestLeaf Advanced Hydrolyzed Collagen Peptides. It is the cleanest collagen supplement of all the options we tried and gives you a big dose of type I, II, and III at a very reasonable price. Best of all, it is flavorless and mixes easily in any liquid even if it’s cold, making it a great addition to your morning glass of OJ.